This pair of Onkyo SKH-410 speakers is a convenient and affordable way to unlock the full Dolby Atmos sound experience in your home theater. You get to keep your existing speaker setup exactly as you like it, with no need to install in-ceiling speakers. 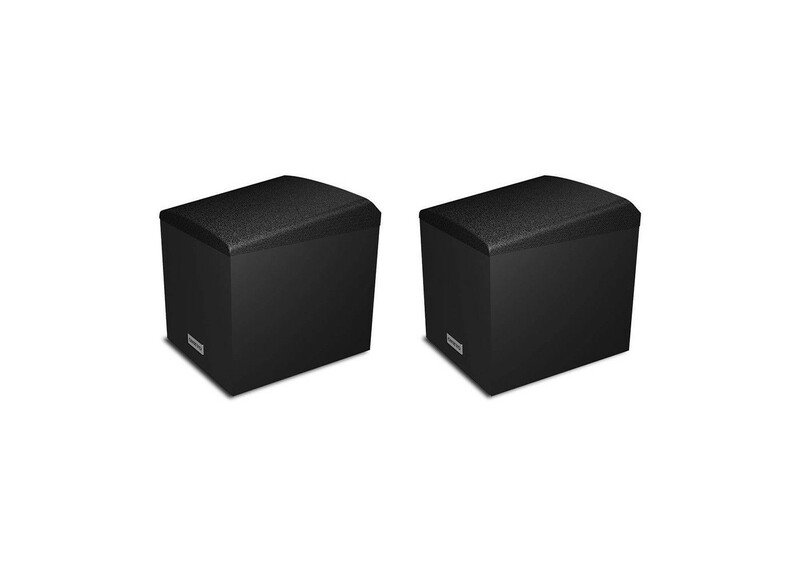 The Onkyo SKH-410 speaker modules connect to your Dolby Atmos-compatible A/V receiver's height channels and are designed to sit on top of your floorstanding front speakers or on an entertainment unit. The handsome black modules contain a Dolby Atmos-certified special network that allows the angled full-range driver to beam sound "objects" -such as birdcalls or an aircraft- off your ceiling and into your ears. The result is a multi-dimensional sound, with precisely localized effects moving over and all around you, an intensely realistic sonic experience that truly puts you in the middle of the scene. The speaker modules are constructed from sturdy wood and finished in woodgrain laminate, and include two speaker cables and rubber anti-vibration feet to protect your speakers or furniture. Once connected, you can sit back and lose yourself in a seamless multi-dimensional sphere of living sound courtesy of Onkyo and Dolby. Compatible Onkyo A/V receivers decode, scale, and calibrate Dolby Atmos to suit home theater configurations using 7, 9 or 11 channels. These receivers feature Dual 32-bit DSP engines that enable them to decode and deliver Dolby Atmos format to a home theater layout. Wall-Mount Bracket: 2 pcs. with Screws: M 3.5 x 16 mm (5/8˝) x 4 pcs.